What if I can’t find my vehicle on your website? If you cannot find your vehicle on our website, please utilise our contact us form or call (1-800-385-3603) with your make, model, year, and body type. We will use the information you provide to locate the perfect CarCovers for your vehicle. We will also add the cover to the website for future customers! All orders to the U.S. and Canada qualify for free shipping! Simply add the cover of your choice to your cart and you will automatically get free shipping with FedEx, UPS, or USPS when you are in the contiguous U.S. and Canada! Orders to PO Box addresses, Alaska, Hawaii, and Puerto Rico are fulfilled with USPS Parcel Select. After your order is processed, you will receive an email with confirmation of your purchase and address. Orders are generally shipped within 1 business day after the order is placed. Once it has shipped, you will be emailed the tracking number. It generally takes 2 to 7 days after your order is processed to receive your cover via FedEx or UPS Ground. Orders sent via USPS Parcel Post generally take 1-3 weeks on average. International orders may take 1-3 weeks for delivery. When we ship your purchase, you will automatically be provided with a tracking number via e-mail. You can use this number to track your package online twenty-four hours a day, seven days a week. When will I receive my car cover? Orders typically ship out on the next business day. Our shipping methods in the 48 contiguous states guarantee delivery within 2-7 business days from the shipping date. Fortunately, we will work with you to cancel or make changes to your order. To make any urgent order changes or a cancellation, please call us immediately. Our phone number is 1-800-385-3603. Please note: orders can be cancelled up until 11:00am PST Monday-Friday. Any cancellation requests made after 11:00am PST cannot be accommodated. What if I want to return my car cover? We will accept your return if it is requested within thirty days. For more information, please see our Return Policy. Yes, we do ship internationally! For international orders, the customer must pay the shipping cost which will be shown on the checkout page. If you do not see your country listed on the drop-down list on the checkout page, please contact us. You can make a purchase using Visa, MasterCard, American Express, Discover, PayPal, or Amazon Checkout. If you would like to pay by check, cashier's check, or money order, please call our support line 1-800-385-3603. We can have an invoice e-mailed or mailed to you upon request, and you can mail the invoice to us along with payment. Is using a credit card online safe? We understand your concern, which is why we are dedicated to providing a secure payment method. We use Secure Socket Layer (SSL), which encrypts your information before it is sent, to protect your credit card. 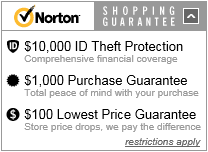 Also, we ensure your information remains encrypted until we process your purchase. How should I wash my car cover? You can wash your car cover with a commercial washing machine without a center agitator or by hand. Using a commercial washer, add a delicate soap such as Woolite. Remember to set the washer to “Delicate.” To hand wash your car cover dilute a mild detergent, such as Woolite, in cold or warm water and lightly cleanse the cover with a sponge. How should I dry my car cover? We recommend you air dry your cover. If you are using a machine dryer, DO NOT USE HEAT as that setting will shrink the cover. What if there is a thin layer of ice between my vehicle and the car cover? Rarely, a thin layer of ice will form between your vehicle and the car cover. Fortunately, there is a quick and simple solution! Thaw the ice before removing the cover. To do so, pour warm water over the cover and attempt to gently lift the cover. If you encounter a problem, repeat the process. There is a tag on the inside of the cover that indicates which side is the front. Install the cover at the front of your vehicle first. Next, pull the cover over the top of your vehicle. Finally, stretch the rear hem of the cover over the back bumper of your vehicle. How do I attach my car cover to my car? Car covers have an elastic hem at both the front and the back to ensure a snug fit. In addition, our car covers have grommets on both sides. These grommets fit perfectly with a cable/lock set! All prices listed online are in U.S. Dollars (USD). If you are purchasing from outside the U.S. in a different currency, please note that the amount shown on your payment card statement will differ from the amount shown on your CarCovers.com order confirmation due to the difference in currency. What about my car's antenna? Removing your antenna before using the car cover will provide you with the best possible fit. Alternatively, you can create an antenna-sized hole in the cover and apply the adhesive-backed antenna patch to reinforce the hole in the cover. When should I tie down my cover? You should be prepared to tie down your cover, using the Gust Strap Wind Protector when you are in a high wind area. Otherwise, the wind can carry your cover away. You can call us anytime between the hours of 7:30AM-4:30PM Pacific Time, Monday through Friday.